Are the Predators in on Letang? Almost a year ago, at this time of the year, the Predators were sitting waiting to hear word about the future of their blueline, with both Ryan Suter and Shea Weber exploring possibilities outside of the Music City. With Ryan Suter taking his talents to the Twin Cities and Shea Weber returning to Nashville after the team matched the offer sheet he signed with the Philadelphia Flyers, the Predators are still missing the perfect compliment to Weber on defense. With rumors swirling that Norris Trophy Finalist Kris Letang, from the Penguins, might be available at the right price, the Predators should be one of the first teams burning up the telephone lines. 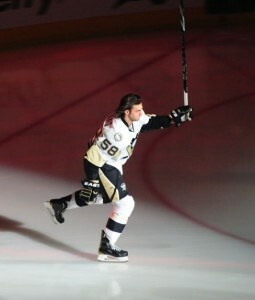 Does Letang Make Sense in Nashville? After Ryan Suter left Nashville for the wintery retreat of Minnesota, in a manner that left Predators GM David Poile searching for answers, the Predators went out and ensured that they wouldn’t lose both of their stud defenseman and matched the large offer-sheet that he signed with the Flyers. Over the course of the year, Shea Weber regained his form after struggling early in the season and although youngsters, especially Roman Josi, stepped up and filled in where they could, they were still weak on defense. Simply put, the Predators need offense wherever they can get it and Letang would provide the largest boost of offense in franchise history. Yes, an unfortunately consistent defensive liability, but on a Predators team, where he would be able to excel in his role as a true offensive defenseman, his defensive lapses would be back-filled by the presence of Shea Weber. A defensive-pairing of Weber-Letang would put the Predators in a position to jump start rushes up the ice, as well as field a legitimate 1-2 punch again on the blue line during powerplays. At a salary of $3.5 Million for another season, the Predators would have a year of Letang in Nashville, with the opportunity to convince Letang to stay long-term over that time. Looking towards the future, the Predators would have the first chance to re-sign Letang to a long-term deal. 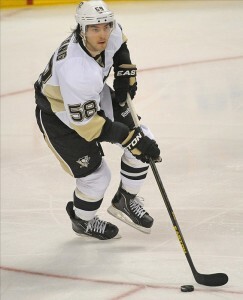 Does Nashville Make Sense for the Penguins and Letang? It wouldn’t be a stretch to say that Predators fans and management would be excited to see number fifty-eight lace up for the blue and gold in 2013, but the more pressing concerns are what would it take to acquire Letang from the Penguins and would the Predators be able to sign him to a deal at the end of this contract. The rumored asking price for Letang, coming off a season where he averaged a point a game and was a Norris Trophy finalist, is understandably hefty. The Penguins and crafty General Manager Ray Shero will most likely be looking for some combination of a young top-4 defenseman, such as Jonathon Blum or Victor Bartley, a top prospect, such as Austin Watson, a bottom-six checking forward, and the fourth overall pick in the 2013 Entry Draft. If the Predators decide that Letang, one of the top defenseman in the league, is worth that return, the Predators could definitely be a player in the Letang sweeps. Lastly, the million-dollar question for the Predators, or more like the seven million-dollar question, is whether or not the Predators have a legitimate shot at resigning Letang after this year? The answer is a resounding yes. If Letang is traded to the Penguins this year and learns what the team has to offer, especially with new additions like Filip Forsberg, Letang may be enticed to spend the next significant chunk of his career alongside Shea Weber.